THOUGH nitrogen and nitrates occur naturally, they are at levels that do not harm. But concern is increasing about high concentrations of nitrogen leaching into aquifers from synthetic fertilisers and manure applied to cropland, resulting in nitrate pollution. High-nitrate levels can cause cancer, reproductive disorders and can be lethal for infants. Now a study has shown how nitrate contamination of groundwater in some of California’s most intensely farmed regions has grown worse in recent decades. The contamination will continue to spread, threatening the drinking water supplies of more than 260,000 people, it says. The team from UC Davis Department of Land, Air and Water Resources analysed groundwater data of Tulare Lake Basin and Salinas Valley of California. They found that more than 90 per cent of the contamination comes from farms, ranches and crops. It says that nitrate in drinking water today came from nitrates introduced decades ago. “Decades from now nitrate in water will be from today’s discharges. 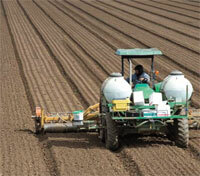 Nitrate contamination will be an issue for years to come,” says Thomas Harter, the lead author. The study which was mandated by legislation in the state in 2008 also notes that removing nitrates from groundwater is costly and not feasible. It says the cost of treating drinking water would increase over time as more nitrate percolates. The study thus suggests an approach based on fertiliser management and water treatment systems. Laurel Firestone, co-executive director of Tulare County’s Community Water Centre, suggests a fertiliser fee could help control nitrate contamination.